Greenville County urges you to Recycle Correctly and Recycle More! Think of recyclables as raw materials that will be used to manufacture new products. As with any raw materials, certain requirements have to be met in order for recyclables to be usable. If unacceptable or improperly prepared materials are placed in recycling containers, the entire load will be contaminated. To prevent this from happening, please clean recyclables prior to recycling them and only recycle those items that can be recycled in Greenville County. In addition to the unstaffed dropoff sites located throughout Greenville County, Recycling dropoff boxes are also located at staffed Residential Waste and Recycling Centers and the Twin Chimneys Landfill. See our page on 'What Can I Recycle' for items to recycle. Leaving your materials stacked outside a recycling dropoff container is littering and may subject you to fines under the County code. It also poses a safety hazard to others trying to use the dropoffs, looks unsightly, and sometimes results in dropoffs being banned from the parking lot of the sponsoring organizations. Please participate correctly by placing your recyclables inside the appropriate compartments! Look at the labels on products that you buy. Products that are made from recycled materials usually state that they are "recycled". When you buy products made from recycled materials, you create a greater demand for recyclables. This helps ensure that recycling programs can continue to generate revenues from the sale of recyclables, and consequently make recycling affordable and economically feasible. Your home recycling program depends on you. It is easy to get started, and when you are in the habit, recycling is a breeze. You don't need to buy a thing: a box and some bags are all you need. Place a simple cardboard box near the place where you go through your mail. Discard all your junk mail and other paper products in this box. Ask for paper bags the next time you go to the grocery. Then place these paper bags near your trash can. Or, if you have limited space, place them in a closet, in your garage, in the pantry, in the cabinet under the sink, you decide. Determine your schedule for taking the recyclables to a recycling dropoff site, to a Residential Waste and Recycling Center, or to the curb. Educate your family. Call a family meeting if necessary to explain what is recyclable, how your recyclables must be prepared, and where your recyclables go. Paper products compose 40% of the waste generated in your house. You can start small by recycling mixed paper including junk mail, envelopes, writing paper, toilet paper ends, food boxes, and newspapers. The longer your recyclables sit around, the more will accumulate and the more likely you are to view the recyclables as 'smelly garbage'. Schedule a day for recycling and stick to it. If you take your recyclables to a dropoff center, it will take longer to sort the recyclables one-by-one into the recycling container compartments, versus having an entire bag full of aluminum cans that you can pour into the container compartment. Be prepared to place all of your recyclables in the recycling containers. Placing them beside the bin is littering! Note: Some of the items listed below that are not readily recyclable at Greenville County locations can be recycled by private organizations. See our Hard to Recycle Items list for more information. Metal containers and scrap metal are readily recyclable in Greenville County. Metal containers include such items as aluminum cans, bi-metal cans (such as soup cans), and aerosol cans, (such as shaving cream cans). Metal containers are accepted at all Greenville County dropoff sites, at all Residential Waste and Recycling Centers and at the Twin Chimneys Landfill. Scrap metal, including appliances that are commonly referred to as white goods, can be recycled as well but generally not with the metal containers. Scrap metal is accepted at Residential Waste and Recycling Centers and the Twin Chimneys Landfill but not at dropoff centers. All municipal curbside programs, with the exception of Greer who only accepts aluminum cans, accept metal containers for curbside recycling along with other curbside recyclables. However, the different municipalities handle collection of scrap metal in various manners. Thus, it is best to contact your municipal collector prior to attempting to recycle scrap metal with them. Paper products are the single greatest component of municipal solid wastes. A little less than 40 percent of the wastes generated in the US is paper. Paper is easily recyclable. In fact, paper products are recycled at a higher rate than any other municipal solid wastes. In the 1980's, most recycling programs began by recycling newspapers. This seemed like a logical approach to recycling because newspapers tended to accumulate from day to day and took up a lot of space in the trash can when thrown away. However, newspapers compose only 15% of the waste paper stream. Thus, an additional 85% of the waste paper stream is not captured if paper recycling is limited to newspapers only. Furthermore, advances in technology and demand for post-consumer paper have broadened the types of paper that are acceptable for recycling in the US. Mixed paper is accepted in all Greenville County dropoff sites, Residential Waste and Recycling Centers, the Twin Chimneys Landfill and in all municipal curbside programs except Mauldin and Travelers Rest where recycling of paper products is limited to newspapers, only. Mixed paper recycling by private organizations varies. Mixed paper can be composed of any paper product from newspapers, to junk mail, to phone books, to colored glossy magazines, to bright colored paper, to envelopes and other office paper, to cereal boxes, to toilet paper ends. You name it: mixed paper accepts it. The only exceptions are contaminated products (e.g. paper plates, tissue paper, napkins) and coated paper such as foil wrapping paper and wax lined cartons (e.g., ice cream and frozen foods' containers). Corrugated cardboard may be dropped off at any Greenville County recycling dropoff site. All plastic bottles, jugs, and containers are accepted for recycling in Greenville County. 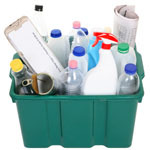 Plastic containers are accepted at all Greenville County dropoff sites, at Residential Waste and Recycling Centers and the Twin Chimneys Landfill.